"The World, the Flesh and the Devil"
The Stratford is currently giving Ben Jonson’s wild 1614 comedy Bartholomew Fair what may be the work’s first professional production in the Western Hemisphere. It is one of Jonson’s greatest works along with Volpone (1606) and The Alchemist (1610), both previously seen at Stratford, and more experimental than either. We have to be grateful to the Festival for finally giving us a chance to see the play. If the the result is not ideal, it still is good enough that no one who wants to understand the context of Shakespeare and his plays should miss it. 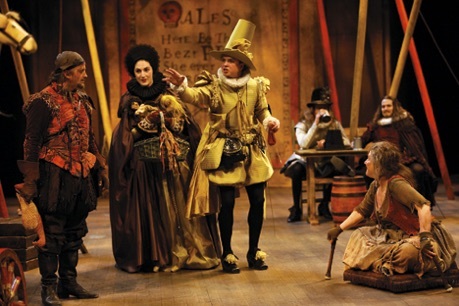 Shakespeare’s comedies, set in nature like As You Like It or in mythical lands like Twelfth Night are, in fact, atypical of comedy of the period. Shakespeare’s contemporaries favoured what is called “city comedy” set in the here and now of their own London. The closest Shakespeare comes to this is The Merry Wives of Windsor, but then even that has a forest scene. Only Measure for Measure, set among the lowlife of “Vienna” comes close to the harsh satirical tone of the city comedies. Of these, Jonson was a master and Bartholomew Fair is an extraordinary effort to put practically the whole world of his contemporary London on stage. The fair was one of London’s most popular, in existence from 1133 to 1855, and began on August 24 to run for two weeks. Shakespeare’s Jacques says that “All the world’s a stage”, but in this play all the world is a fair, one that includes the stage. Those like Mikhail Bakhtin who theorize that comedy is “carnivalesque” could hardly have a better example than Bartholomew Fair. 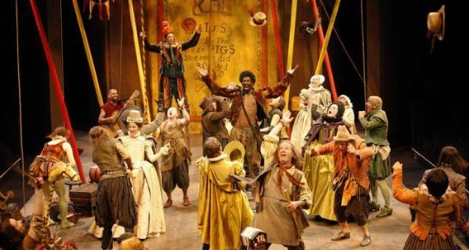 Jonson’s play that follows the adventures of multiple small groups of people, both fair-goers and fair-workers, is amazingly cinematic in its structure, rather like a Robert Altman film conceived 360 years ahead of time. Four characters or groups of characters attend the fair. Most important is Justice Adam Overdo (Tom McCamus), who takes on various disguises in order to seek out illegal practices or what he terms “enormities”. Second is a group of Puritans surrounding the fraudulent preacher and self-professed prophet Zeal-of-the-Land Busy (Juan Chioran). With him are his sister Dame Purecraft (Brigit Wilson), her daughter Win (Jennifer Paterson) and Win’s husband John Littlewit (Matt Steinberg). Next there is Winwife (Christopher Prentice), who is trying to woo Dame Purecraft because of her wealth, and his friend Quarlous (Jonathan Goad). The fourth group is centred on the rich nincompoop Bartholomew Cokes (Trent Pardy), who is engaged to the lovely Grace Wellborn (Alana Hawley). She is Justice Overdo’s ward and thus is accompanied by Overdo’s wife Mistress Alice Overdo (Dalal Badr). Bartholomew wants everyone to go to “his” fair, but his servant Humphrey Wasp (Brian Tree), aware of how gullible Bartholomew is, insists on keeping a close eye on his master. Once these four groups of outsiders enter the fair, they break up and reconnect in multiple ways. Primarily, Winwife and Quarlous compete to see who can win Grace Wellborn away from Cokes. Dame Purecraft searches for the mad nobleman a fortune-teller has predicted she would marry. John Littlewit seeks to have his latest play produced by the fair's puppet theatre. Meanwhile, at the fair, other intrigues are going on. The very embodiment of the “enormities” of the fair, literally and physically, is the grossly obese Ursla the pig-woman (Lucy Peacock). Besides, selling roast pork, she runs all the illegal activities at the fair such as having her boy tapster Mooncalf (Abigail Winter-Culliford) water down drinks, taking a commission on money stolen by the cutpurse Ezekiel Edgworth (Jesse Aaron Dwyer) and prostitution run by the pimp Whit (Victor Ertmanis). In the final act her booth will also be the site for that ultimate in decptions, a puppet play. Her lover is the horse-dealer Jordan Knockem (Randy Hughson), a devotee of the contemporary game of “vapours”, a debate of contradiction for its own sake won by whoever can shout down the other. Other key booth-owners are Lantern Leatherhead (Colin Heath) a seller of trinkets and toys and the fair’s puppeteer; Joan Trash (Kelli Fox), the gingerbread lady; and the madman Trouble-all (Ian Lake), a good man driven mad by the harshness of Justice Overdo. play more than anyone else, triumphs over all. The fair makes fools of all with vanity enough to think they are above it. Cokes remains who he is. Director Antoni Cimolino does guide us through the play but not with as much clarity as is required. The crucial exposition of the main characters and the plot is given to Matt Steinberg and Jennifer Paterson as John and Win Littlewit, who are not experienced enough actors to make sense of what they are saying. Thus, we start off on the wrong foot. Jonson expected his audience to absorb oral information more thoroughly than we moderns do, so that if we miss the who’s who at the beginning we spend the rest of the show trying to catch up. Cimolino tries to make the intercut dialogues clear by spreading the speakers widely through the theatre so that we have to turn to look at who is speaking. This works to some extent but doesn’t help when Jonson layers his play with characters commenting on characters commenting on others. The text does mentions “passengers” at the fair (i.e., other fair-goers), but too often the scene is crowded with actors who do not speak. Some in flashy costumes like the Rich Woman and her Rich Son we expect will speak but they do not. In a play with so many characters to start with and where Jonson keeps introducing new characters into the last act, the presence of these non-speaking actors simply makes things more confusing. Worst, though, is Cimolino’s attempts to make the play funnier by adding lots of slapstick, funny accents, silly walks and other annoyances. The action is already so complex any added irrelevance is distracting. What the production has in its favour are its host of wonderful performances. McCamus, Chioran and Tree are absolutely priceless as the three authority figures. McCamus as the the man who would see all but mistakes everything gives one of his best comic performances. Chioran’s hypocritical pomposity and Tree’s easy anger are hilarious. 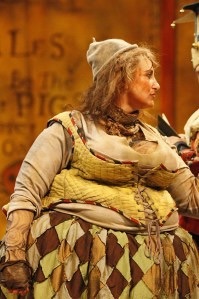 Peacock in a grotesquely funny fat-suit makes a marvellous Ursla, a kind of female Falstaff, a role quite unlike anything she’s ever done before. Hughson as her lover is also funny and almost makes you understand the game of vapours. The young Winter-Culliford, amazing as Moth in Love’s Labours Lost last year, amazes again with the clarity of her line readings. 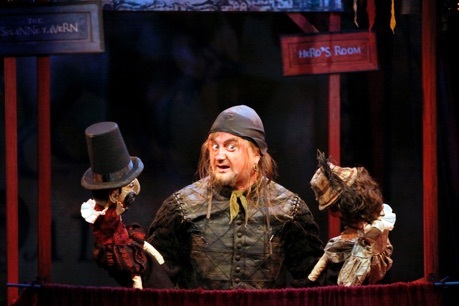 Heath and Fox makes the most of their roles, and Heath is especially funny when he becomes the head puppeteer of the puppet show, a bawdy retelling of “Hero and Leander”. Prentice and Goad as the two competing friends are not well-matched, Goad making much more sense of his lines than Prentice. The open-faced, wide-eyed Pardy is ideal as the eternal child Cokes. Carolyn M. Smith thankfully does not follow the Stratford tradition of prettifying poverty. The black-clad Puritans and the wealthy silver-clad Cokes and Quarlous groups are clearly distinguished from the earthen colours of the fair’s tradespeople, who look like they have lived in their stained and ragged clothing for far too long. Steven Hawkins‘ lighting cast an autumnal glow over the proceedings which looks lovely except when we recall that the fair takes place in summer. Ex-Bare Naked Lady Steven Page supplies the pleasant but unmemorable music. The moral of Jonson’s play is that we must accept the world whole, with all its faults, and so we should with this production. It achieves the feeling of barely controlled chaos, but the individual threads of the play need to clearer and the pace snappier. It would help everyone if the metaphorical sense of Jonson’s kaleidoscopic realism were stronger especially since Cimolino has omitted Jonson’s Induction that debates the proper subject for art. Once we realize that the play represents not merely a portrait of a certain time and place but also philosophical attitude toward the world and theatre itself, then all of the play’s pieces fall into place and the real achievement of Jonson’s work shines through. Still, this is a production that must be seen since, sadly, when are we ever likely to see this play again? It makes us hope to see more of Jonson and more of Shakespeare’s contemporaries, English and continental, in future seasons. Photos: (from top) the cast of Bartholomew Fair; Cliff Saunders as Lantern Leatherhead, Dalal Badr as Mistress Overdo, Trent Pardy as Cokes and Kelli Fox as Joan Trash; Lucy Peacock as Ursla; Cliff Saunders as Lantern Leatherhead. ©David Hou.